A cool day with a chance for showers. DENVER — It has been a quiet start to the week for Colorado, with mostly cloudy skies over the Front Range and eastern plains. A weak weather disturbance will spread scattered rain and snow over the plains and light snow in the mountains. Temperatures will not be very chilly early Tuesday with lows in the upper teens to low 20s in the mountains and middle 20s to low 30s on the plains. Some light snow showers will continue as the weak disturbance slips across the state from the north. This minor storm will bring a chance for a few inches of snow to the central and southern mountains, but just clouds, cool temperatures, and a few showers for Denver and the eastern plains. Spring officially begins on Wednesday at 3:58 PM. 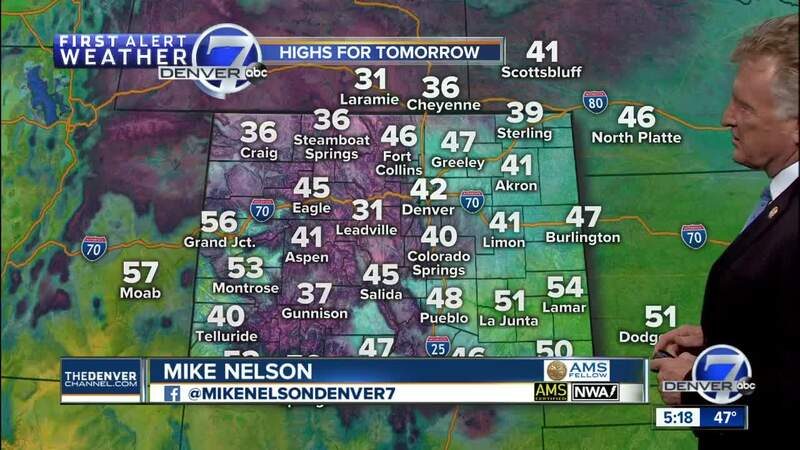 Temperatures will feel a little more spring-like, in the mid-50s for the Denver area and middle 30s to low 40s in the mountains. Thursday will be mild and dry with highs in the 40s in the mountains and 50s to low 60s across the eastern plains. Another weak storm will spread some light rain and snow over Colorado on Friday - but it will not be a big deal. By the first weekend in Spring, the weather will return to warm and dry with highs in Denver around 60 degrees. Next week will see a return to a snowy pattern for the mountains and we will keep an eye out for changing conditions for Denver and the eastern plains. For now, just enjoy a quieter stretch of weather!